Three years ago, concerns about the heart risks associated with the painkiller Vioxx triggered an escalating crisis for the drugmaker Merck that culminated with the withdrawal of the drug in September 2004, the eventual resignation of the CEO and fierce criticism of the Food and Drug Administration for failing to identify the risks of the drug before it was approved. Now a study released by the New England Journal of Medicine has linked one of the most commonly prescribed diabetes drugs, Avandia, to a significant increase in the risk of heart attack. But both the FDA and Avandia's manufacturer, the British pharmaceutical giant GlaxoSmithKline, are moving quickly to try to avoid being engulfed in a similar debacle. Renowned heart scientist Dr. Steven Nissen of the Cleveland Clinic, lead author of the study, analyzed what happened to 15,560 patients who were given Avandia and 12,283 in a control group. Using data from already published studies, Nissen found 86 myocardial infarctions in the group that took rosiglitzone, the chemical name for Avandia, compared with 72 in the control group. The number of deaths from heart disease was also higher  39 among people who took the drug, compared to 22 for the control group. A few dozen deaths out of more than 15,000 subjects may seem small, but these results were from short-term studies. More than 65% of all people with diabetes eventually die of heart disease, so over the course of patients' lifetimes that few dozen could become thousands. Nissen acknowledges the limitations of his data, but writes that because the drug is so widely used, and because this population is so vulnerable to heart disease, anything that increases their risk of heart attacks is "worrisome" and warrants further study. Nissen tells TIME that he started looking into Avandia because he was concerned by the data in two of the largest studies of patients taking the drug. "The cardiovascular events were all going the wrong direction," he says. Though the results weren't statistically significant, they pushed him to look at other data sets, including studies by the FDA and from the clinical-trials registry on GlaxoSmithKline's website. Nissen had gathered his data by April 24, and six days later submitted the paper to the Journal's editors. The results of Nissen's research were troubling enough that the Journal, in an editorial accompanying his article, concluded that "the rationale for prescribing rosiglitazone at this time is unclear." The cardiovascular risks simply outweigh any benefit the drug appears to give in treating diabetes, the editorial says, and the FDA should now take regulatory action. With more than 1.5 million new cases of Type 2 diabetes each year in the U.S. and Avandia a mainstay in their treatment, 60 million prescriptions have been written since the drug was introduced in 1999. GlaxoSmithKline shares took an immediate hit from the release of Nissen's study, falling 7.85% on Monday, with more than 11 million shares  nine times the usual trading volume  changing hands. Investors, not surprisingly, were spooked by the doubts raised about Avandia, which accounted for $3.2 billion in sales last year for GSK. The company went on the offensive almost immediately, releasing a statement criticizing Nissen's research methods. "GSK strongly disagrees with the conclusions reached in the NEJM article, which are based on incomplete evidence and a methodology that the author admits has significant limitations," read the statement. Mary Anne Rhyne, a GSK spokesperson, notes that Nissen's study was a meta-analysis  a study of other studies  rather than direct observation of patients. "We place more weight on observational studies," Rhyne says. The FDA, however, moved quickly to respond to what it called "a potential safety issue related to Avandia," issuing a safety alert on the drug just hours after Nissen's study was made public. While the agency pointed out that other studies of the drug have reached different conclusions, it nonetheless will take up the issue of the cardiovascular risk of Avandia and similar drugs with an advisory committee "as soon as one can be convened." 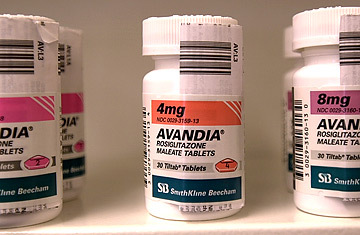 Earlier data about Avandia prompted the FDA to strengthen the drug's warning label last year. The FDA also disclosed that GSK recently provided its own meta-analysis of Avandia patients, which found a 30% to 40% greater risk of heart attack than patients in a control group. "These data, if confirmed, would be of significant concern," the FDA statement read. GSK submitted that information to the FDA last fall, Rhyne says, but so far the agency has not recommended any action based on it. "We've shared what we have, and we've done so in a timely and appropriate way," she says. That may prove to be a key issue as the FDA, scientists, investors and patients weigh their next move on Avandia. Merck's undoing, after all, wasn't just the data; it was concerns over the disclosure of it. Says Nissen: "There will be a lot of questions about who knew what, when."